Billionaire Mike Ashley's Sports Direct said it did not intend to make an offer to buy Debenhams after lenders took control of the ailing retailer today. Sports Direct had until April 22 to make a firm offer for the retailer or walk away under British takeover rules. Earlier, Debenhams' lenders took control of the ailing retailer after it went into administration, wiping out shareholders including billionaire Mike Ashley in the latest corporate failure on the UK high street. Once the biggest department store chain in the UK, Debenhams had been hit by a sharp slowdown in sales, high rents and ballooning debt. It also had to deal with an acrimonious battle for control with its largest shareholder, Ashley's Sports Direct. Ashley, the owner of Newcastle United who has poached a number of other struggling chains, had spent tens of millions of pounds building up a 30% stake over several years. While Debenhams stores will keep trading, the administrators said they would push ahead with a plan to close about 50 underperforming stores and demand rent cuts, moves it said were "critical" to its survival. The plan puts about 4,000 jobs at risk. The administration is another blow to a retail sector already reeling from the collapse of BHS, electronics firm Maplin, department store House of Fraser and cycle shop Evans. The latter two were snapped up by Ashley. 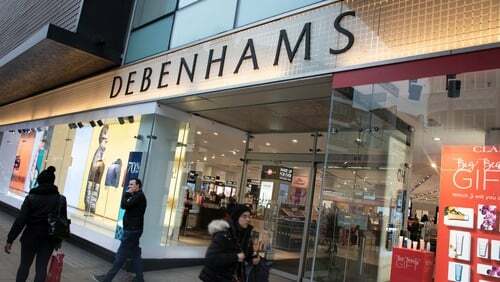 Administrators from FTI Consulting immediately sold Debenhams' holding company to a new entity owned by its lenders. Contracts with stores, staff and suppliers were held by its operating companies and will not be affected, it said. "It is disappointing to reach a conclusion that will result in no value for our equity holders," Chairman Terry Duddy said. "However, this transaction will allow Debenhams to continue trading as normal; access the funding we need; and proceed with executing our turnaround plans, whilst deleveraging the group's balance sheet," he added. Ashley had spent months battling to wrest control of the business, offering a rescue plan that came with the condition he was appointed the chief executive. With tensions increasing between the two sides, Ashley even demanded that Debenhams board members take lie detector tests. A person familiar with the situation has told Reuters that there has been a total breakdown of trust with Ashley, and that Debenhams feared that if he became CEO he would renege on his financial promise and put the company into administration himself, allowing him to select only the stores he wanted to own. Despite its long history, Debenhams has been battling for survival after a consumer shift online and to cheaper outlets left it with too much retail space on struggling high streets, destroying 90% of its share value in the past year. At the time of its collapse it had debt up to £720m and a market valuation of £22m. In 2018 it had 19 million customers and £2.9 billion in sales. A spokesperson for Debenhams said its 11 shops in the Republic of Ireland are not affected by today's developments as they are a separate operation. Debenhams Retail Ireland Ltd exited examinership in 2016, having entered the process after it said that high rents at its Irish outlets were making its business here unsustainable. It has a number of shops in Dublin, as well as in Newbridge in Co Kildare, Galway, Limerick, Tralee, Cork and Waterford. Debenhams also has five shops in Northern Ireland and it is not yet known if they are among the 50 stores that the company said they will close by 2020.